I went to the new, gleaming Waitrose in Bloomsbury last week to get something for supper. I was, as I always am at Waitrose, impressed by the variety of the offerings: jerusalem artichokes, sharon fruit and cave-aged gruyere among them. But I stopped when I got to the packaged fresh fish. I am a regular buyer of fresh fish at Waitrose, but this visit I found the selection less than inspiring. I think I've been spoiled for life. You see, I spent a couple of weeks in Barbados last month. 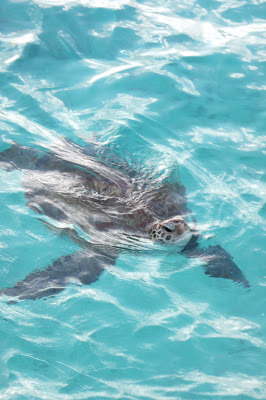 Apart from being rich in oil and fertile land, Barbados is surrounded by the sea, and therefore lots of fresh fish. 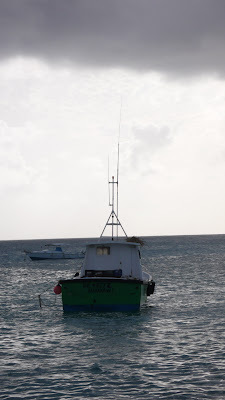 Barracuda, Yellow Fin Tuna, Dolphin (aka Mahi Mahi) and Flying Fish are amongst the regular catches that come into the fish markets in Bridgetown and Oistins. It is Oistins that has ruined my enjoyment of Waitrose. Are there seaturtles swimming off the pier at Waitrose? Mmm, no piers at Waitrose. Are there local farmers who set up shop in the parking lot selling their tomatoes, cucumbers and ground provisions (vegetables from the ground such as yams and potatoes) at Waitrose? Negative. 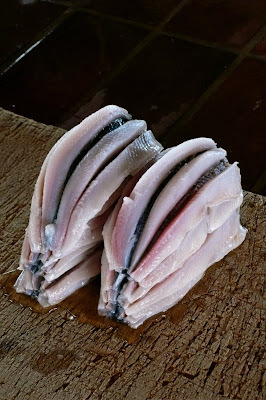 Is there fresh fish, caught that day, being filleted before your eyes? Most definitely not. My absolute favourite way to prepare the local favourite, flying fish, is fried with Bajan seasoning in a salt bread cutter. 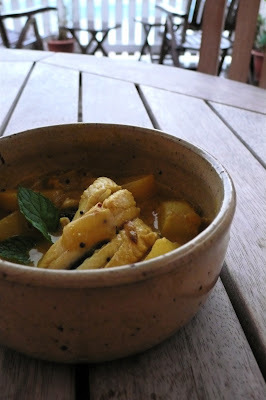 However, this south-Indian inspired curry is a popular dinner in our house and has been evolving over many trips to Barbados, each year getting better than the last (except the year that I bought sweetened coconut milk aka pina colada mix by accident and didn't realise until I thought hmm, this is terribly sweet...). Up to the addition of the fish, the curry can be made in advance - you just have to reheat the sauce and add the fish about ten minutes before serving. In a deep, wide frying pan that will eventually hold the whole curry, heat the oil and add the onions with a pinch of salt. Saute over a medium heat, but don't let them brown. When they are beginning to soften add the garlic, ginger and chilli and continue to stir until the onions are transparent and the garlic has softened and begin to turn golden. 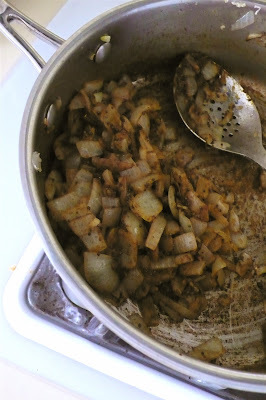 Add dry spices and fry until they release a strong aroma. Just about ten minutes before you are ready to serve the curry you should be ready to add the fish. This means bringing the sauce to a slow, slightly bubbly simmer, which should only take a couple of minutes if you have just made the sauce, but allow time for this if it has been refrigerated. You may need to remove the ground provisions from the sauce to fit all the fish into the pot - use your judgement. Nestle the rolled fillets into the sauce, trying to keep them rolled as much as possible, and spooning sauce over them as you go. By the time you've put them all in the first one should be ready to be gently turned over. 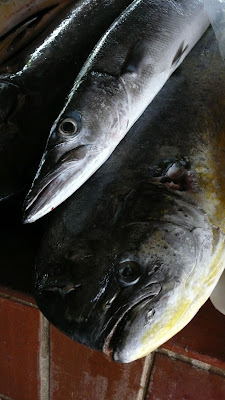 Cooking time depends on the amount of fish you have, the tightness of the pot and many other factors. I would always vere on the side of under rather than overcooked, because the fish will continue to cook on it's way to, and at, the table. But if you take a piece out it should look opaque on the outside, flake apart when pushed and be ever-so-slightly less opaque in the centre, but not translucent. Add the ground provisions back to the pot. Serve over basmati rice garnished with chopped green onions, coriander and a wedge of lime.